As many of us are still making that horrible winter commute, some are considering freelance writing from home as a happy alternative. 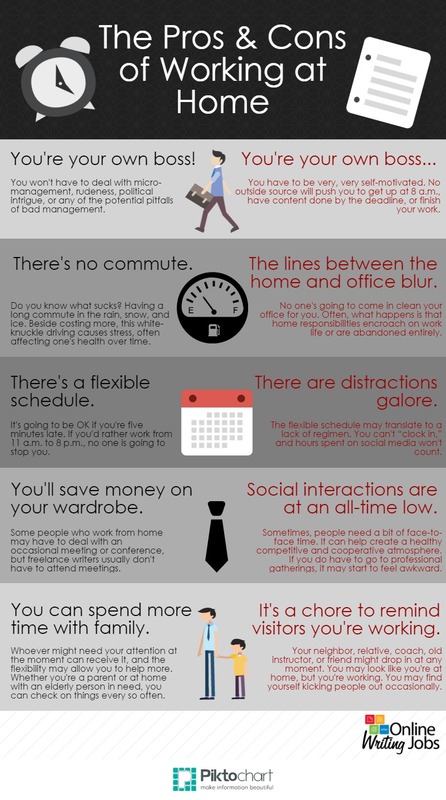 However, there are many pros and cons of working from home. See if that new lifestyle is right for you! Stephanie Nolan, an editor for Online Writing Jobs, is a graduate of the S.I. Newhouse School of Public Communications at Syracuse University. Since college, she's both edited and written film scripts, press releases, fictional stories, and articles. After gaining professional experience with Public Relations, Human Resources, and Recruitment, she discovered OWJ. With her strong marketing background and love of the written word, she now found a great balance while working with online content. heyy, I am from India. Can i work for you?? Hi Nikita, Thanks for your interest in applying with OWJ. Right now we are only available to legal U.S. residents. Should that change in the future, we hope you’ll consider applying. Thank you! At the last two decades a number of people who work from home is increasing. I think this way of working is comfortable. As for me, I am a writer on essaypenguins.com and I write my essays at home, this way of working is preferable for me because I do not face with traffic jams, I spend a lot of time with my family and I have work-home balance. Of course, there are some cons of such lifestyle but to my mind, working from home is less stressful. Hi, Yolanda. Many of our writers agree that the stay-at-home life is worth it. Feel free to apply to our site if you’re interested in picking up a few more writing jobs.